Deep-V hulls are not typically known for fuel efficiency, because they require more power to lift onto plane than boats with flatter bottoms. The best way to overcome this issue is to build a lighter boat. Less weight to lift means less power needed, and less fuel consumed. This is where Mirage has the advantage, because we are experts at working with advanced weight-saving laminates, both in the marine and aviation industries. We never cut corners that would result in a weaker or inferior boat, but we do find numerous ways to shave excess weight. As a result, our boats weigh in far lighter than conventional deep-V designs of similar size, and this difference can be seen at the fuel dock. Efficiency is an easy claim to make and, even when documented, not always reflective of the real world. The fuel consumption numbers reported in the boating press are often based on measurements taken in calm water and ideal conditions. We feel it's more accurate to base such evaluations on real-world use as reported by our owners, who spend hundreds of hours operating in all sea conditions. Based on this broader evaluation, we are confident that Mirage boats are some of the most fuel-efficient in their class. 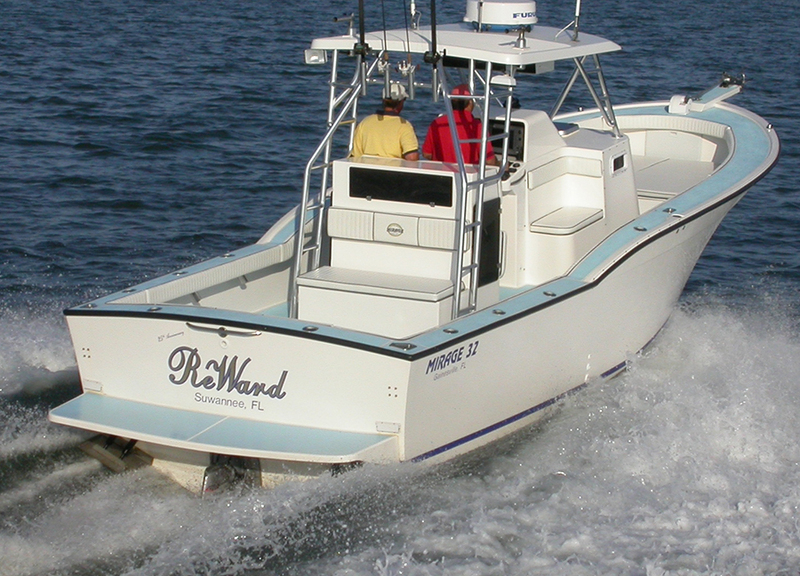 For example, our 32 center console, equipped with a single Volvo KAD300 will consistently deliver an average 3.5 mpg at a cruise speed of 33 mph. With standard fuel capacity, this provides a range of 700 miles. Similar efficiencies can be found across our line, whether powered by single or twin diesels, or outboards.